Can you please show how you lofted the two ends of the spiral grooves? Well guys, this was a little bit challenging!! I think we are ready now to do the hole bottle. 1. 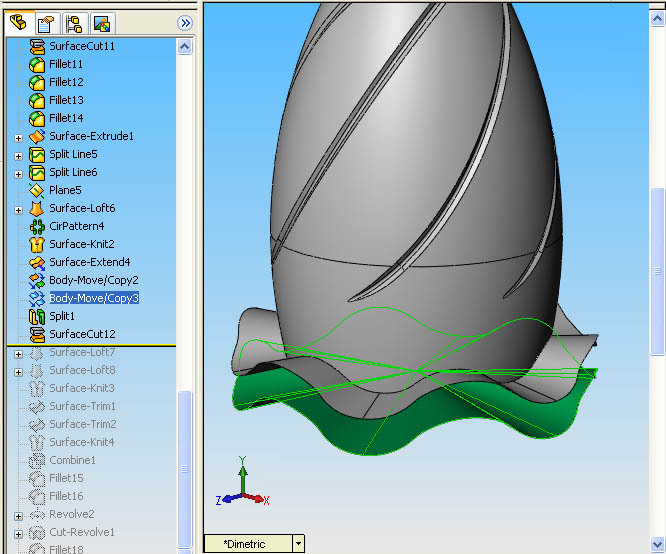 Extrude a cilynder (surface). 2. 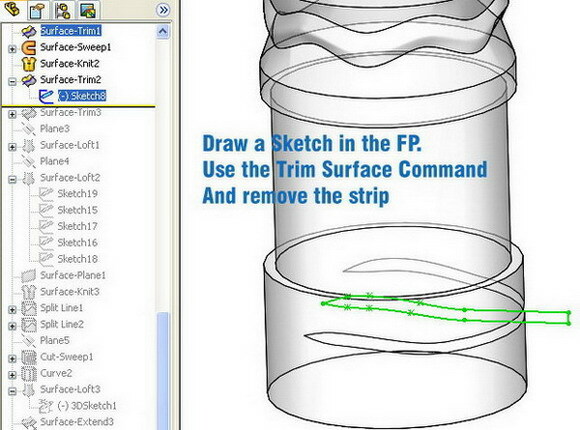 Draw two sketches in the Front Plane with the shapes. 3. Trim the cilynder with the two sketches. 4. 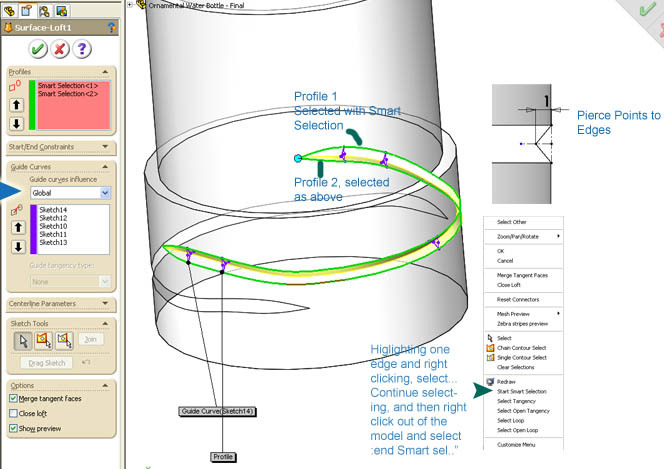 Draw several Sketches as guide curves for the transversal section of the grooves. 6. Close the cilynder with 2 planar surf. 7. Convert to a solid. (Let me know if you need more info about). 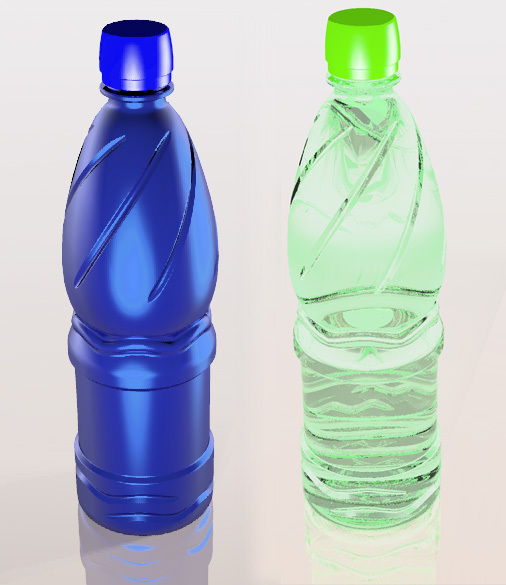 Heres a completed bottle. The middle section was a little tricky. 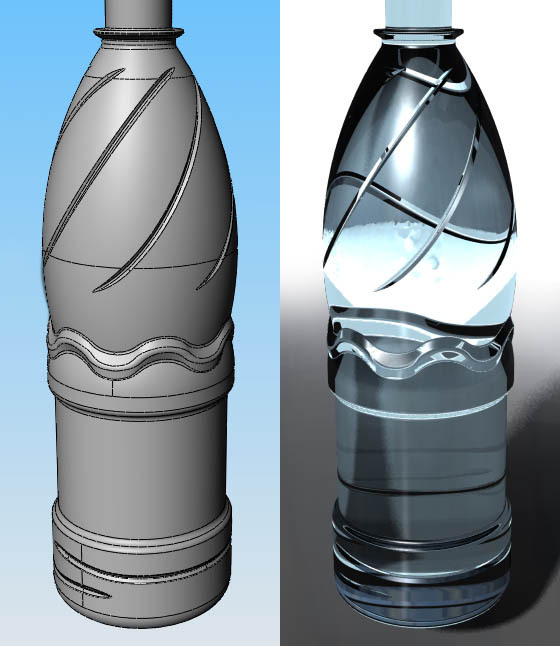 I created a curve that covered 60Â° of the bottle. 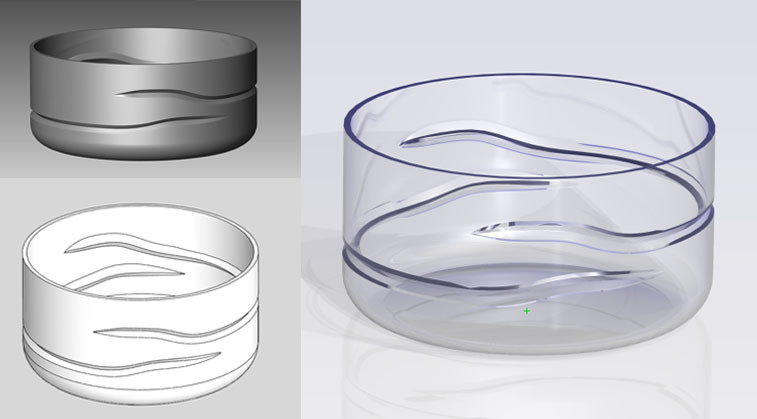 I then lofted the curve into a surface and circ patterned to create a wavey face. 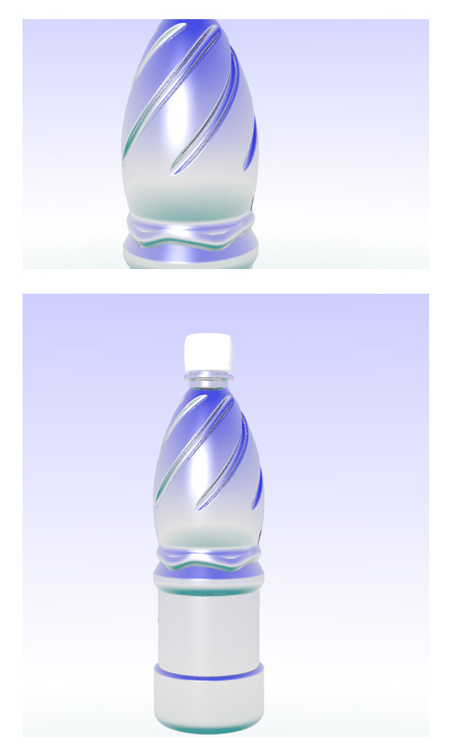 I then copied it up and down and trimed the bottle. A circle was projected onto the middle wavey surface and trimed. 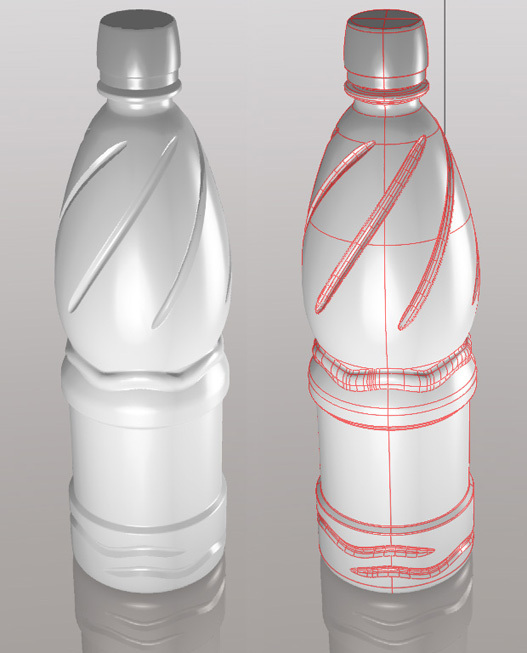 Then lofts were created between the edges of the middle surface and the trimmed ends of the bottle. Stiched together and combined back into the bottle. The bottom curves were made similar to the top ones. Heres the loft for the tips of the top grooves. I am going to post mine in a few days, the mid zone is the most tricky, yes. Very good approach. For the Mid Zone detail I used the WRAP feature. I drew a sketch tangent to the cilynder, in that sketch I drew one spline with 3 waves, then "wrap" "deboss" to the halve of the cilynder. Then split and mirror. In that way I got the ondulated surface to guide the final Swept. this is what I came up with... the bottom part is giving me trouble.. Very nice, Perfectude!! it looks very pro. The bottom part is really very easy to do (by the way do you work in SW?). I am going to post some images of the making of that zone. Or maybe some other friend could do that. But this afternoon I will put the images. Wich method did you use for the 6 top spirals?? This is my finished bottle ! So far 3 of us presented a work done... nice!! Can you show more detail on how you did the middle section. It sounds very interesting. Well I finally got it this morning.. I use Rhino 3d with Flamingo as a render. I mostly did it the easy wa since this is not going into production.. 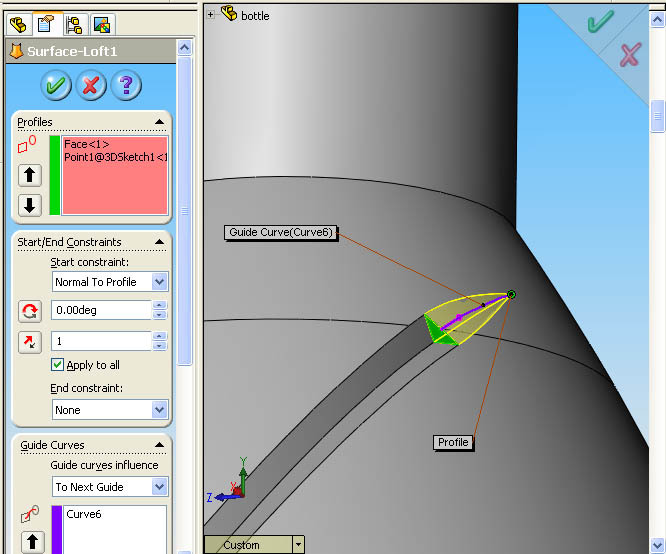 Pipe, booleene dif, and fillet, some blending.. AND LOTS OF FUN! Ok few more hours on this, decide to finnish this tonight and here I am at 2AM. Still have some minor fillets to do but it would take yonks. Anyways good work all! I think we had learned a Lot of this experience (At least myself). 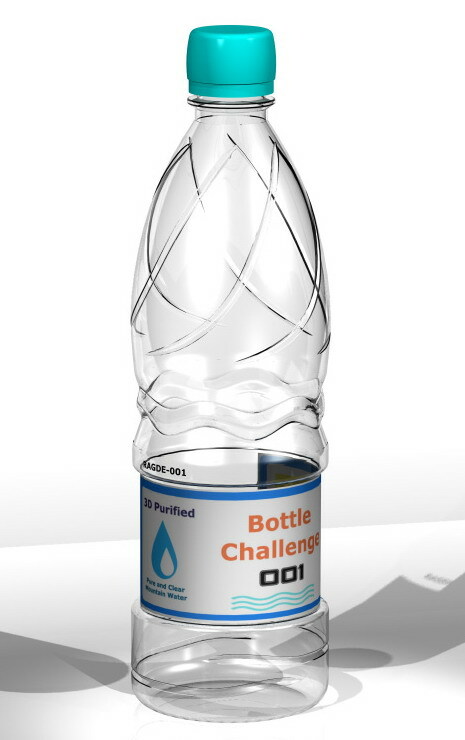 Ciao... AND BE PREPARED FOR BOTTLE CHALLENGE 002 !! !